Upcycled art piece by Jeff Manderville. Where some see trash, others see treasure. Discarded bits of wood, items no longer in fashion, something for the donation box or the dumpster. Whether you call it recycling, repurposing or upcycling, using unconventional surfaces and materials in art is a balance of pragmatics and whimsy for the four artists in the "Upcycled Art" show at Jacklin Arts and Cultural Center through Sept. 5. For AbbyLynn Henning, the scraps of metal she'd see on the floor while working as business development manager at River City Fabrication inspired her to action. "Birds' nests are so dainty and fragile, and yet they're wound together in such a [similar] way," says Henning, who envisioned weaving the discarded ribbons of metal and mesh into a nest. Henning attended Rhode Island School of Design for photography and has experimented in a variety of art forms, although she'd never welded. Encouraged by coworkers — she calls herself an "abricator" (versus fabricator) — Henning taught herself to tack-weld and patina the metal she uses in nests, small birds and other forms, which she also shows at Angel Gallery of Fine Arts & Antiques in Coeur d'Alene. Like Henning, Megan Holden often works with scraps — chandelier crystals, bottle caps, a fork, watch casings — to create fantastical jewelry like "Wilde Love," a tribute to playwright Oscar Wilde. Her style, ranging from retro to steampunk to theatrical, is always meticulously detailed. Holden often exhibits at Manic Moon & More, Echo Boutique and Arbor Crest winery, and exhibits elaborate ink drawings under the name Poseidon's Consort. Although none were included in the JACC show, they're worth keeping an eye out for, and are testimony to her savvy as an illustrator. An inveterate collector of unusual objects with a lifelong interest in art, 69-year-old Brian Conley fashioned the 14 pieces for the JACC in a month. From his home near the Coeur d'Alene Reservation, Conley works in a variety of media to express Western and Native American themes. "As the Crow Flies," for example, features a transformed trash can lid adorned with beads and leather. His work reminds one of the ledger paintings of the late George Flett, whom Conley got to know from trading artwork and exhibiting at the Julyamsh Powwow. 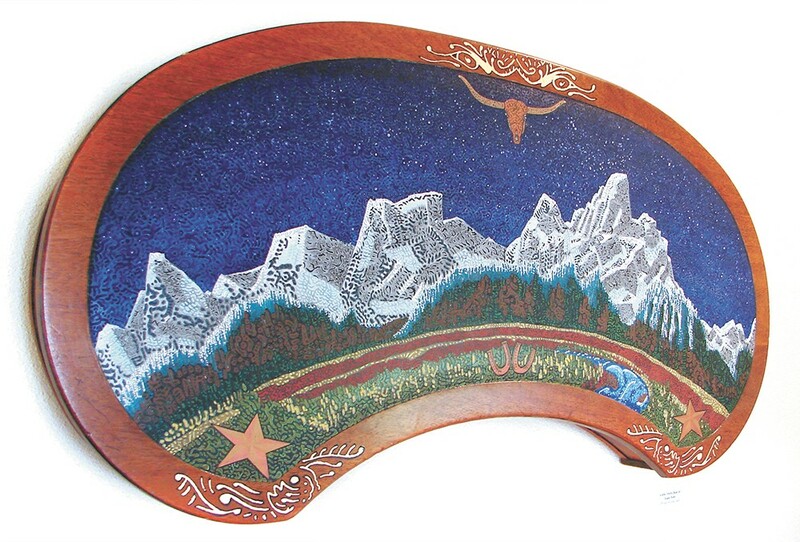 Conley, who first began exhibiting his work at CdA's former Journeys Off the Beaten Path (which closed in 2003), exhibits regularly at Angel Gallery and at Denise Oliver Gallery in Harrison, Idaho. He's best known for his beautiful gourds, which combine acrylic paint and intricately inscribed designs using a modified woodburner. Like Conley, Jeff Manderville often uses paint to transform everyday objects. 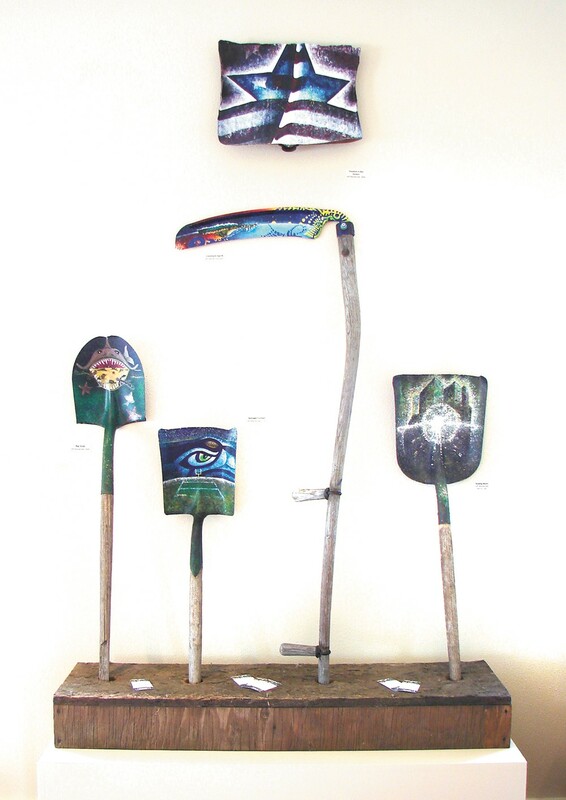 A flat head shovel, for example, becomes the backdrop for a Seahawk-inspired piece celebrating Manderville's Seattle roots. Manderville attended Seattle's Burnley School of Professional Art in the '70s, before it was absorbed by the Art Institutes. After earning his Associate degree at Spokane Falls Community College, Manderville later returned to the Art Institute to earn a degree in desktop publishing. That sense of graphic design is evident in several works, including his three-part "Arrangement" series, which combines calligraphic-like marks and patterns on traditional canvases.